She is Pakistan's first winner of Oscar, Emmy and Livingston award. Her works have mainly focused on social injustices and other human rights issues. Most her work is in form of documentaries she directed which won her international acclaim as a talented director. Her documentary 'Saving Face' was awarded Academy Award for best documentary in 2012. 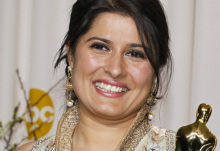 Winning Oscar for this documentary was a personal achievement for Sharmeen Obaid Chinoy and it also highlighted the largely ignored heinous crime of acid-throwing on girls and women in developing countries. She continues to work in film-making under the banner of SOC films. In 2012, she received one of Pakistan's highest national awards, Hilal-i-imtiaz. Her own official website details her works and achievements.